That statement is most telling about where the Left is today. After all, who else envisioned that a peaceful society would come about through violence? That’s right, fascists. Hitler rose to power, accepting and using the same strategy – that the end justifies the means. 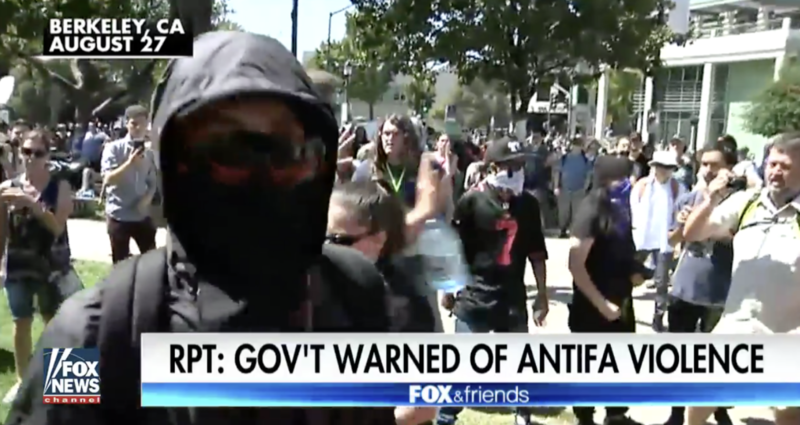 As a millennial working in Washington DC, I meet many left-leaning people my age, and the irony, or perhaps historical contradiction, that is Antifa seems lost on them. Young leftists often claim that, unlike fascism, communism is not an explicitly violent ideology. They are dangerously misguided. Marx could not be clearer – his ideology views violence as a necessary part of the class struggle. The end goal of a communist society, to Marx and his followers, morally justified the death, destruction, and chaos that “revolutionary terror” caused. Thus, it should not be surprising that Stalin’s mass starvations, Pol Pot’s killing fields, and Mao’s purges were part of the official program of those communist governments, under the banner of leftist revolution. Those communist governments killed millions on the basis of class, profession, and ideology. For their part, Fascist governments, also proponents of centralized government, murdered innocent people on the basis of ethnicity and political affiliation. During and in the way of the communist revolutions, professors, priests, and other “enemies of the state” were executed en masse. Like the fascists, Marxist dictators used ideology to justify genocide: millions of Ukrainians were starved under Stalin, and Soviets also executed thousands of Ukrainian farmers for resisting collectivism. One is not morally superior to the other – they are both abhorrent. It is surprising and disheartening that many Americans either do not know that history or refuse to understand that history and its horrible effects. Instead, they are embracing some of its tactics: violence, historical revisionism, and attempts to silence free speech. In addition to radical groups like Antifa gaining prominence, The New York Times is even running a series of articles sympathetic to communism. In one of these pieces, writer Kristen Ghodsee, a professor at Bowdoin College, argues that women enjoyed more rights under communism because they were fully integrated into the labor force and had the right to vote. Vote for what, I wonder? Perhaps such ignorance stems from the fact that most Americans are fortunate enough to never have experienced the horrors of communism firsthand. I was one of them: raised in Southern California, I spent two years in the former Soviet country of Georgia after graduating from college. That experience opened my eyes: for the first time, I learned about the Soviet mass execution of Christian clergy, academics, artists, and patriots who fought for Georgia’s independence. More than anything, living in Georgia – a beautiful country with endless potential, scarred by decades of Soviet oppression – showed me just how dangerous radical Leftism can be. I also learned what can happen when we don’t read or understand the ideology, the history and the devastating human cost of the movement. In these difficult times, we must condemn fascism and communism unequivocally. There is no room for sympathy, and no excuse for normalization. Both of these ideologies are violent, unjustifiable, and frankly un-American. The Left should keep in mind that the enemy of your enemy is not always your friend. After all, who was the most successful Nazi-killer of all time? That’s right: Josef Stalin.